The first question most relatives ask is, “How far back does it go?” The Farabaugh name can be traced to a Martin Ferenbacher of Kappel-am-Rhein (now Kappel-Grafenhausen), Baden-Württemberg, Germany. 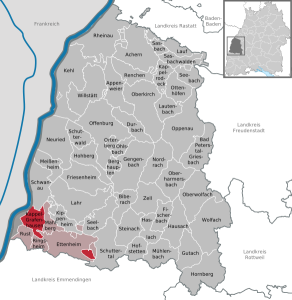 The town is situated on the southwestern edge of the province, close to the Rhine river bordering France, and has roughly 4700 inhabitants today. Martin was born in about 1668 and died on February 18, 1748. This somewhat unsatisfactory account, typed by descendant Fr. Modestus Wirtner, OSB, is confounded by a variation found at page 980 of the History of Cambria County by John E. Gable (1926). 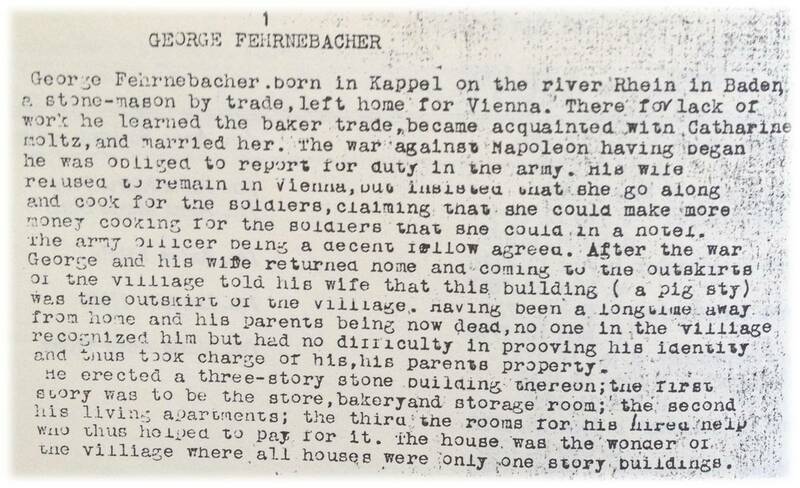 It states that “George Fehernbach” left home for Trier, not Vienna; and that the new house had two stories, not three. It also adds that George was pressed into service a few days after his marriage, and that the bakery he opened was the first ever in the village. Gable cites Fr. Modestus, but one would think that the first-hand account at right would be more reliable. It is possible that Johann Georg fought for Austria. As explained here, Kappel was embroiled in efforts to contain French expansion in 1796, with local militia and farmers siding with Austrian forces. Johann George and Catherine Motz were married around this time, and having no children yet Catherine was free to join him to cook for the soldiers. Austria’s defeat at Austerlitz in December of 1805, by which time they had their first two children, would have triggered their return to Kappel. On the other hand, the account’s indication that Johann Georg was “obliged to report to duty” and went to Vienna suggests he later fought for France. Napoleon forced local recruitment and advanced on Vienna after Austerlitz, and Johann Georg could have fought in that campaign or on any of the numerous fronts that expanded France’s empire. My bus trip to Salt Lake City yielded the microfilmed records from the Roman Catholic Church of Sts. Cyprian and Justina, which lay out the entire genealogy of Kappel in beautiful Latin prose. This church was established in 1737 and was destroyed along with the historic cemetery and much of the town, by Allied bombing in 1945. At left is the current church constructed in 1955, and you can hear its five church bells here. The Kirchenbuch from this church records the baptisms, marriages and deaths of all the early Fehrenbachers. The original Kirchenbuch (which begins in 1804) and earlier civic records were evidently stored at the Kappel Rathaus (town hall). They were the source materials for the definitive history of that community, Albert Köbele’s Dorfsippenbuch Kappel am Rhein. The story of the Farabaugh’s Germanic roots is not complete without Michael Ferenbacher (1808-1856). Michael was the grandfather of one Cambria County’s most famous natives, the steel magnate Charles M. Schwab (1862-1939). 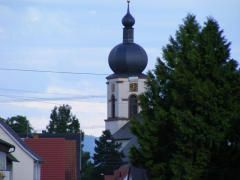 Michael was not closely related to the Fehrenbachers of Kappel. He was from Schuterttal, located a short distance to the east (click on the map above). Michael moved away from the area to Regelsbach where he was a brewmaster, left for America with his young family, and settled in Munster Township in Cambria County no later than 1847. A German video promotion for Kappel-Grafenhausen. This gives a profile of how the town looks today.